I couldn’t be more excited to be back in Cambodia. My journey in this eccentric country began in the summer of 2013. I yearned to write about my experiences but found it difficult to get these captivating and intricate thoughts onto paper. You see, it was hard to put into words- the beauty, poverty, charm, ignorance, love, and the hate that makes up the city of Siem Reap, Cambodia. As much of an irony as those characterizes are, they completely encompass these grounds and it was important that I become competent of that. I hate the poverty, but love the beauty I find in every sweet child, naked and dirty, with a smile from ear to ear. I hate the ignorance, but love the charm in every girl who sees a hope for a future that her society won’t allow her to have. The biggest irony of them all though, is that some may call these girls naive and their dreams hopeless but I… I call them warriors. My first day back to school- I run into the salon (which was built for our students so they would have a place to work as soon as they were done with school) and am immediately overwhelmed with the space…its lovely! Wood floors, track lighting, and a beautiful chandelier hanging from the ceiling. I was so happy to finally see it in person. Even more than the space, though, I was most ecstatic to see the girls. They ran towards me as we squealed and jumped up and down like a bunch of giddy school girls! It has been 6 long months of missing them and I was overjoyed that I finally with them again. My feelings of a proud mama were overwhelming with how much they have grown from the first time I meet them 7 months ago. After school that day, a student invited me and one of the other instructors, Heidi, to her salon, which is one the other side of town. It was Heidi’s last day and she wanted to give her a manicure as a going away gift. 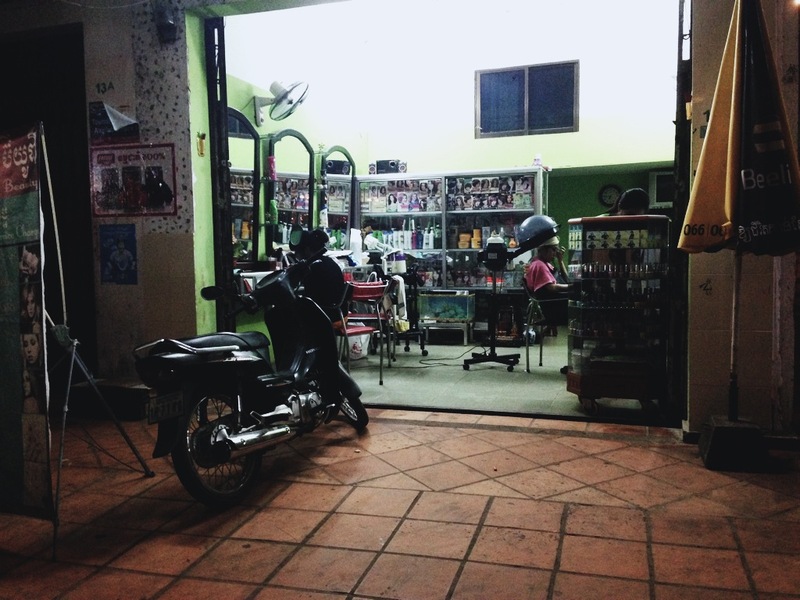 As we waited for her to finish with another client, we began chatting with them, along with the salon owner ( mind you, in our broken Khmer and their broken English). As we shared our passions and purpose for being here, she asked for me personally, to cut her hair and our student’s client asked for Heidi to do her makeup. Although a small gesture to many, this was a bonding experience that broke through language barriers and allowed us to share love and friendship. This was just another normal day in the salon. After I was done cutting and styling the owners hair, our student’s next client came in. She was a sweet smiley girl, no more than 15. She greeted us all before she bounced into her stylist’s chair. She pulled out a small bag from her purse and began doing her makeup at the same time as her hair was being done. We became intrigued as her demeanor slowly started to transform coinciding with her new face and hairstyle. Starting with her foundation, which would have better suited for my pale skin rather than her natural deep olive tone, I was mesmerized at how her spark dimmed with each pass of her makeup sponge. As the stylist finished her hair and as her face turned geisha white, she added pastel pink blush, black eyeliner, mascara, and bright pink lip gloss. I sat across the salon from her gazing at her reflection in the mirror which was filled with so much sadness. Holding my breath was all I could do not to cry, knowing that in 5 minutes she would walk across the street to work at the largest brothel in this red light district…A brothel that caters to men from all over the world. The Bystander Effect (if you don’t know what that is, shame on you and Google it!) happens on a daily basis. I promised myself that I would never be a bystander. Ever. No matter how uncomfortable the situation. Today, a horrible feeling and guilt and shame came over me. Why didn’t I continue to talk to her? Why didn’t I try to stop her from leaving? Why didn’t I help her? Was I a “bystander”? Today, was I the one thing I promised I’d never be? I dwelled on her for while. Too long maybe. But being right in front of a girl who is suiting up for the fight of her life is the motivation I need to continue my work here. While she is fighting to survive tonight, I will fight for her further. However long it takes, I will fight.